In qualitative research, the marketing research process consists of eight steps. Successful qualitative research is largely the result of good preparation and planning. The better prepared you are, the greater chance of getting the insights you need. A well-designed plan leads to business intelligence, knowledge, and perhaps wisdom. It connects managers to customers, users, and the market. A plan is your outline for research action. A typical qualitative marketing research plan consists of eight steps. Successful interviewing starts with clear research objectives. Clearly defining research objectives is the most important step in the entire interviewing plan. It is the foundation for the research plan. Objectives lead to actionable information and knowledge. A well-defined, clear research objective is a vital first step in the marketing research process. At this stage, you decide whom to interview, how many people to interview, where and how to interview them, and your budget. You also decide who will recruit respondents… you, your staff, or professional recruiters. Focus group facilities usually provide recruiting services. You want to make sure you interview the right people to get the information and knowledge you need. Interviewing the wrong people is a waste of time and money. You use a screener to select the right people, usually a segment. A screener is a brief survey. It specifies the characteristics of the people you want to interview. Interviewing calls for project management. You manage respondent recruitment, schedules, and budgets. If you use focus group facilities for recruiting respodents, you check their recruiting frequently - daily - until they've hit recruiting quotas. The moderator guide is an interviewing outline that guides discussion during the interview. The guide contains research objectives, logistics, topics, questions, and activities for a focus group or depth interview. A good guide makes interviewing easy. The better prepared you are, the easier interviewing will be. Moderating is a directed discussion. Your discussion guide is your primary tool for directing discussion. Moderating is easy and fun when you are prepared. Just about anybody can do it with a good discussion guide, skills, and practice. Focus group or interview conversations are the data. Data are the answers to your interview questions. You convert raw data into information and knowledge. Analysis is a crucial part of the marketing research process for qualitative marketing research. A report documents the data, information, and knowledge gained from interviewing. A report tells a story about people, and their thoughts, actions, perceptions, beliefs, and feelings about products, services, and ads. It is a collective snapshot of customers, prospects, or experts. Typically, reports come in three formats: briefing report, summary report, or full report. The marketing research process is straightforward, if you follow the eight steps. On this website, you’ll find articles about each step. 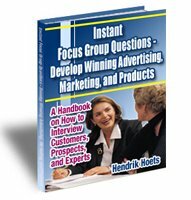 Instant Focus Group Questions e-book is a practical handbook about qualitative marketing research. It's packed with tips, techniques, and hundreds of questions. Click on the e-book to learn more now and get it today.